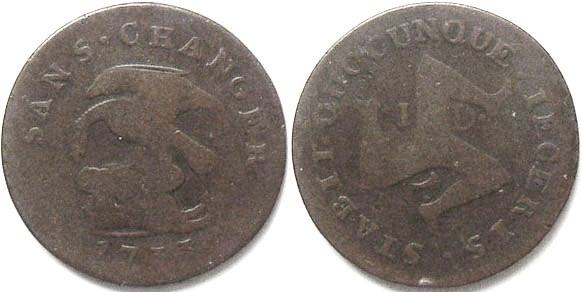 Isle of Man penny, the Earl of Derby's first issue, struck in 1733. Obverse: The Stanley Crest; an eagle clutching a child upon the Cap of Maintenance: “SANS CHANGER” (without change) sarcastically interpreted locally as “short of change”, referring to the scarcity of low denomination currency. The Stanley Crest can be better seen on an illustration of the Stanley Standard flown by the English during their victory over the Scottish forces at the battle of Flodden in 1513 shown at the bottom of the index page. Reverse: Triskeles: “QUOCUNQUE JECERIS STABIT” (which ever way you throw it, it will stand), “I D J.” (horizontal "J") between legs. Weak strike as usual but a reasonable example for the type, see photograph.